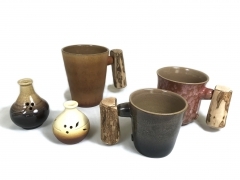 We are looking forward to develop ceramic gift product with customers, the product range is wide: coffee cup, drinking cup, tea cup, milk mug, beer mug and promotional gifts…etc.. The ceramic material provides a natural looking that makes you feel relaxed and comfortable. For example, the ceramic mug is very special with a wooden handle, which let users hold the mug more easily instead of the normal shape. It is also a fascinate idea to make diffusers by ceramic (the small bottle in the left of picture) A diffuser can balance your body, spirit and mind. It is a unique way to enhance the atmosphere and mood.